Originally developed for the arcades and the NES in the late '80s, Super Dodge Ball is making a return as Miracle Kidz announces more details on the remake set for WiiWare release this year. Known in Japan as Downtown Nekketsu Dodgeball, the game will be taking after Nekketsu Koko Dodgeball Bu (known as Super Dodge Ball to the rest of the world) which was developed by Technos for the NES. Downtown Nekketsu Dodgeball will be a modern rearrangement of the original, with Artificial Intelligence, gameplay systems, and other areas updated for the current generation. Turning the Wii Remote sideways, gamers will be able to control their own team during matches, or if you'd rather watch from the sidelines, the A.I. customisation system can be used instead to let the computer control the on-screen players, effectively turning the match into a simulation if the final scores are all you want. Of the two modes that are available; Tournament mode will task a single player to play against the A.I. by controlling the players directly or by using the A.I. customisation system, and Match mode will allow single matches between player and computer, or player against player. 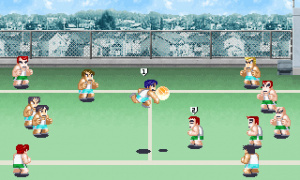 Downtown Nekketsu Dodgeball is scheduled for release on the Japanese WiiWare service this May but there's currently no indication on whether this will make it outside of Japan or not. With no sign of Super Dodge Ball on the European Virtual Console, maybe this will be a nice treat for Euro gamers if it gets localised at some point. 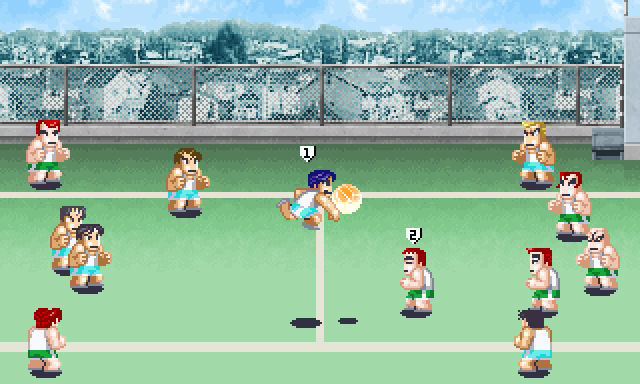 To find out more on the 8-bit version, head over to our Super Dodge Ball review. First River City Ransom 2, now this... I'm loving all these revivals! INSTANT DOWNLOAD! WOO HOO! This and River City Ransom 2? Kunio-kun Heaven! I friggin LOVE Super Dodge Ball! Still play it on VC when the mood strikes. I hope they have remixes of the incredible music from the NES game. Now all Miracle Kidz needs to do is bring back Renegade, Double Dragon and Crash 'N The Boys. You know? That one game with Crash, and the Boys? Wow this is great I cant wait. I hope they bring out the other games like Nintendo World Cup and Crash and the Boys. Sounds like a winner to me, though. Nice! I love Super Dodge Ball. Going to be awesome, can't wait! Since the NES version still hasn't hit Europe's Virtual Console, this is something to look forward to. Super Dodge Ball is awesome. I hope this makes it outside of Japan. Man, if Crash and the Boys is next, I may never get back up. I swear Miracle Kidz heard my prayer for these games... Love the Kunio Kun games! this is an all time classic. Killed many an hour at childhood sleepovers. a new version would be very welcome for fans of the original, of which there are many.